Okay….for those of you following this blog I will have to teach you how to pronounce this when I get home…There is no easy way for me to do so in writing, and even the Garmin said it differently each time…in any case, that’s where we went today. 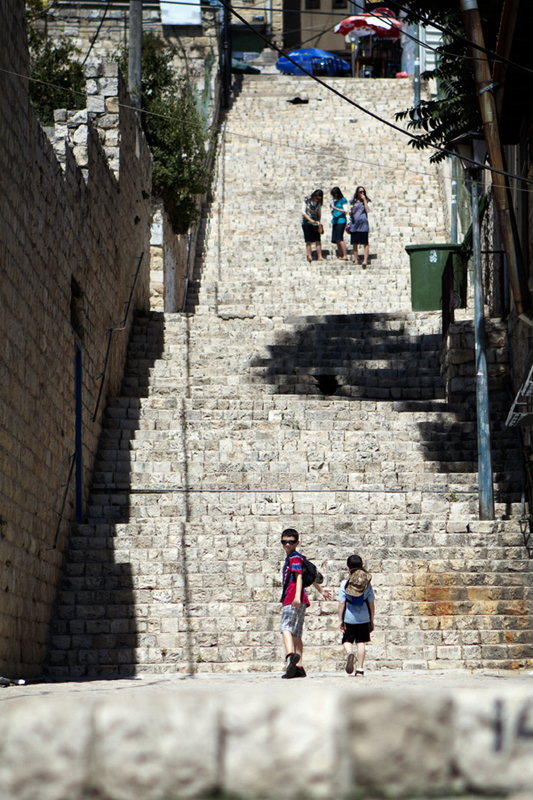 Tsefat is a very old city in Northern Galilee that has grown to be a thriving center for two things….first, it is an artist colony. Second, it is a center for Kabbalah, or Jewish mysticism. Let’s talk about each of those separately. As we made our way toward the old city, we wandered into a bakery…OMG!!!! The smells from the fresh baked breads and pastries was out of this world. I bought a big bag of sorted rugelach for the kids to share. If you don’t know what a rugelach is, click here to read more. If you do know, or once you find out, you’ll understand why I also bought a few extra for me…chocolate and cinnamon. The only thing better than the way the pastries smelled, was the way they tasted. Packaged ruggies from Wegman’s will just never be the same again! From there we continued wandering until we found the Artist Colony. To get there we had to descend a few steps, but once at the bottom we were faced with a variety of genres and shops from which to choose…we chose the one with the biggest sign…”Glass Blowing: Live Demonstration”. After stopping into a few shops along the way, we finally made it to the glass blowing shop of Sheva Chaya Shaiman. She was a very pleasant young woman, originally from Denver and a graduate of Princeton University, who immediately started to show us some of her favorite water color paintings, and then began to demonstrate how she works with glass. 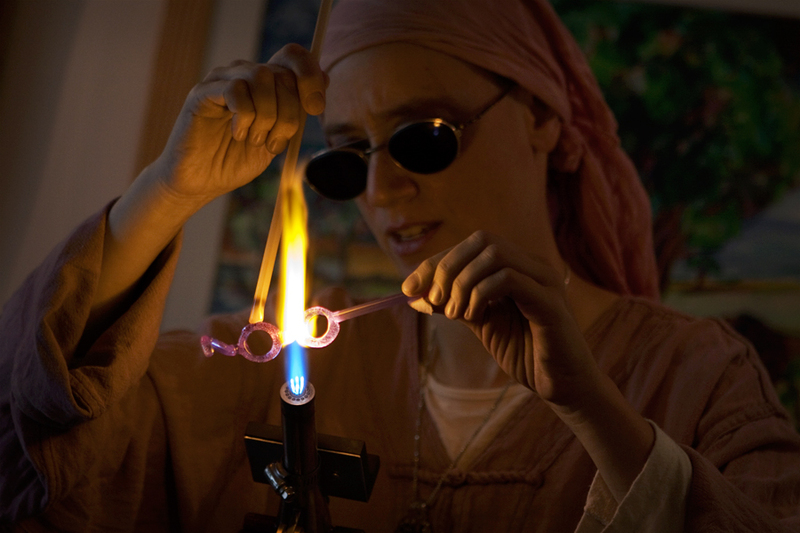 As she transformed a rod of glass into a set of glass eye glasses, she explained the connection that her art has to the forces of nature and Judaism. While we were all impressed with her art, some felt that her attempt at teaching was a bit odd….personally I liked it, and since this is my story that’s all that matters!!! After the demo, we wandered through the streets where some galleries were large, almost museum like, and others were simply small one room cut-outs from the wall with a roll down door that doubled as the store front when closed. Behind the door, when opened, are the tiny shops that consist of a single glass counter in which hand made crafts, jewelry and art was displayed. As we wandered some of us saw pieces of art in which we were interested, but in trying not to buy the first thing we saw, we pushed onward through the maze of shops and galleries. After lunch, which consisted of over-priced salads, pasta and quiche (I think it was Ryan who said “why did you come to Israel to get French food for lunch?”), we made pour way back through the shops. One of the firs t ones we stopped at was that of a silversmith who made hand crafted jewelry. 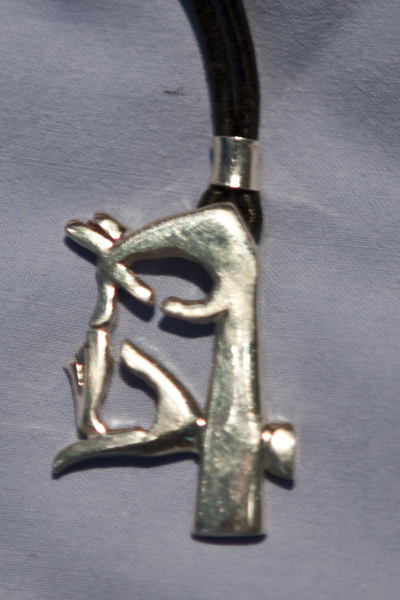 One of the pendants he had was crafted in the shape of two hand touching. The space between the hands resembles the Hebrew letter Aleph. In Hebrew, each letter also has a numerical value, and the letter Aleph is also the number one. Therefore, these two hands joined form the letter Aleph, which is one….two combine to make one. I liked not only the artwork itself, but also the symbolism behind it. As I mentioned in previous entries, my wedding anniversary was earlier this week, so this became a perfect gift for Rachel. The symbolic meaning behind the two hands is a simple example of Jewish mysticism, or kabbalah. To know and understand kabbalah requires a great deal of study. In recent years it has been introduced to pop culture by celebrities such as Madonna and Demi Moore. I have always been interested in this stuff, but since I don’t understand much of the mainstream aspects of the Jewish religion, I have not ventured far into the teachings of kabbalah. 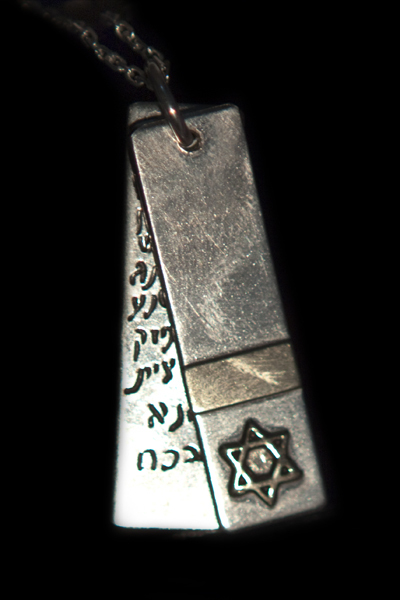 That said, I did also buy myself something today….a double silver pendant with a Magen David, or Jewish star in the front behind which there is a Hebrew engraving of a song written several hundred years ago by a famous Rabbi. The song itself is supposed to inspire peace. In addition, the first letter of each line of the song combines to spell the Hebrew name of God. Ugh!!! I looked in every nasty, filthy stall in the place and there was not a single shred of paper to be found. I told him to sit right there (like he was going anyplace else) and that I would be right back. Immediately I did what any father would do in such a situation….I ran to the car to get Rachel!!! Its not that I could not have handled the situation….I would have glad sacrificed my socks, or torn my shirt into several smaller pieces to help clean up the situation. However, why do that when your wife speaks Hebrew and can ask one of the Israelis in the area whether or not they have a few pieces of TP that they would be willing to share with woefully under-prepared Americans. My plan worked….not only did one guy have some, but he had wet wipes….even better!!!! Thus ends another day in the adventures of the Kasper’s trek through Israel….tomorrow involves hot springs and a water park…I’m sure we’ll get ourselves into some interesting predicament to report on….until then….Lila Tov (remember, that means good night).